Healthy Soup with a Bonus for New Moms. 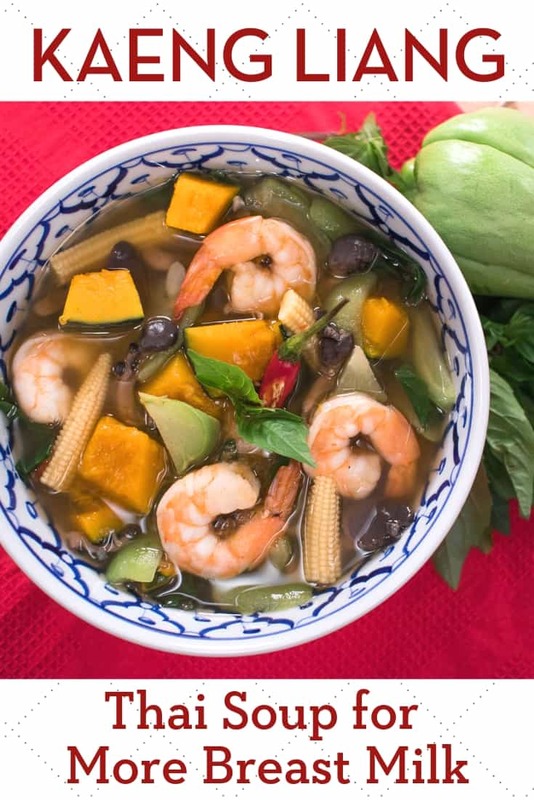 Since I became pregnant, many people have asked whether there is a dish in Thai culture that pregnant and new mothers are encouraged to eat. And this is it! 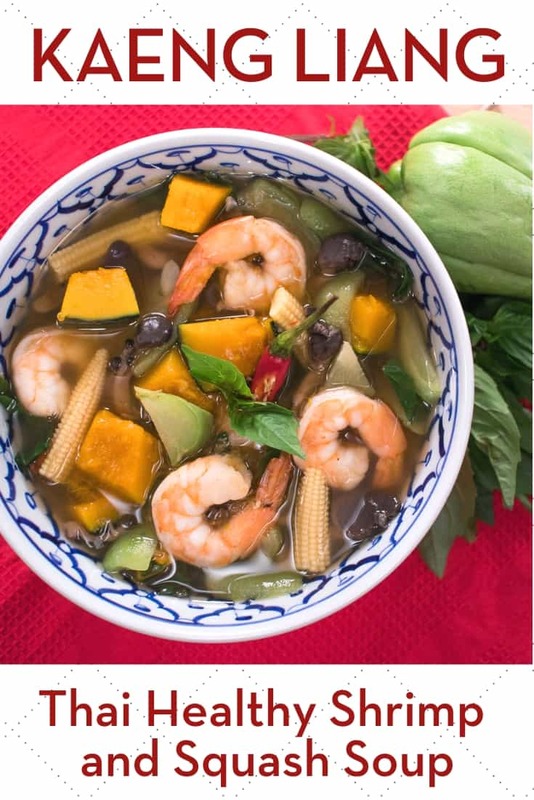 Kaeng Liang or Gaeng Liang is a peppery, light, yummy vegetable soup believed to help boost breast milk supply in Thai culture. Whether or not it actually does, who knows, I don’t think there’s been a real study on it. But hey, it’s delicious and healthy, so why not! Now, if you’re not having a baby, you can still enjoy it! This is not something that is reserved only for new moms—anybody can enjoy it at any time, and people do have it at home regularly, but new moms are especially encouraged to eat more of it. This is a dish I grew up eating, and my grandmother makes it quite often because my mom loves it. It’s also popular amongst the health conscious because it’s full of nutritious vegetables! I have to say that the flavour of this dish is unlike any other dish in Thai cuisine. The combination of dried shrimp, shrimp paste and grachai in the curry paste creates an emergent aroma that is really unique to gaeng liang. It’s a bit funky, and when I was a kid I didn’t love it, and didn’t understand why my mom loved it so much. But now as an adult I do and finally get it! So if you’re new to it, it might take a bit of getting used to, I just wanted you to be prepared for it! Kabocha squash – This will give a sweet, rich, creamy element which you will need to balance all the other lighter vegetables. If you don’t have kabocha, any other sweet, creamy winter squash (like acorn) will do. One type of light summer squash – We traditionally use angled luffa or angled gourd (sing gua), but you can use zucchini, patty pans, cousa squash (shown in the video), chayote, or whatever lighter squash you have access to. One type of Asian mushroom – Oyster mushroom is my favourite, but you can do straw mushrooms, king oyster mushrooms, beech/shimeji mushrooms, or enoki mushrooms. Do not use dried mushrooms as they have a strong earthy flavour that will interfere with the soup. Is it a Curry or a Soup? To Thai people, this dish is a curry (kaeng or gaeng means curry), but I understand that it’s more like a soup in the Western sense of the word. This is because Thai people define curries differently from people in the western world. To us, a curry or a kaeng is any soupy dish that uses a “curry paste”—a ground up mixture of herbs and spices—as the flavour base. So that’s why this is classified as a curry, even though to you it might be a soup. To us, the richness or consistency has nothing to do with whether it’s a curry or not. Another “soupy curry” that’s really popular in Thai cuisine is gaeng som, or a sour curry, you should try it out! *Extra Goodies for Patreon Members: In this episode’s “Show After The Show” I share with you a quick Thai recipe that you can do with any of your leftover squashes, which you will probably have after making this dish. Click here to find out more about becoming a Patreon member!